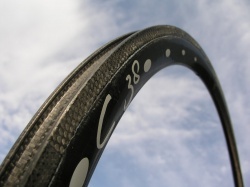 C 38 clincher, full carbon rim with alu extrusion inside for brake surface and spokenipple support, ERD size 566 mm, 475 grammes (+/- 3%), Max. 8 bar, tire size > 23 mm. C 50 clincher, full carbon rim with alu extrusion inside for brake surface and spokenipple support, ERD size 540 mm, 495 grammes (+/- 3 %), Max. 8 bar, tire size > 23 mm. C 90 clincher, full carbon rim with alu extrusion inside for brake surface and spokenipple support, ERD size 461 mm, 615 grammes (+/- 3 %), Max. 8 bar, tire size > 23 mm. 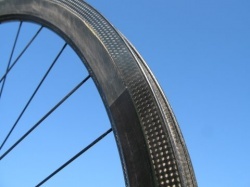 Our full carbon ATB rims only weigh 429 grammes(+/- 3 %) (32 spoke version). Width is 26 mm, height 40 mm. ERD size is 508 mm. Available! !